So let me start out by saying that the name Machine Gun Preacher didn’t exactly do this film any favours by making me want to watch it. Luckily, I decided to try and ignore the name, and actually discovered a film that, while it might not win any prizes, was actually quite a compelling watch. Machine Gun Preacher is inspired by the true story of Sam Childers and his efforts to save children in South Sudan who were targeted by Joseph Kony’s Lord’s Resistance Army (LRA). If those names sound familiar, that’s because in the last week or so the internet has been buzzing after Invisible Children released a film in an effort to make Kony famous, to expose what he has been doing (kidnapping and killing children, forcing them to serve in the LRA or marrying them off to his “soldiers”) and result in his arrest. 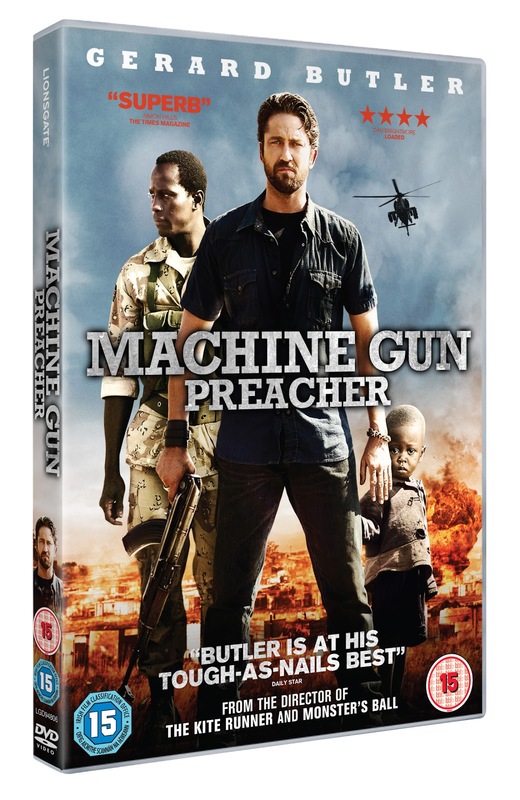 Machine Gun Preacher‘s release is therefore unintentionally well-timed, although it largely ignores Kony in favour of his victims, and is really the story of one man, not one man against another. Played by Gerard Butler, Sam is released from prison intent on going back to his boozy, drug-filled days. The film starts slowly, and I found my attention wandered during the scenes where Sam slipped back into old habits, eventually robbing a house of drug dealers at gunpoint and stealing drugs so he can get high. The first section of the film culminates in a scene where Sam and friend Donnie (Michael Shannon), having robbed the house, are driving home while high, and discover someone in the back seat of the car. Unfortunately, having become a little bit bored, I have no idea who this person was, but he was beaten to a pulp by Sam before being thrown out of the car. Finally feeling guilty about something, Sam gives in and goes with his wife and their daughter to church, where his transformation into upstanding citizen begins. On a visit to church Sam hears from a preacher working in East Africa, and decides to go to the region and do some work there, helping to build homes. This is when the film really picks up. Sam, inspired by the suffering he has seen on a visit to a local hospital, comes back home and builds a church to help all those who don’t feel comfortable in a regular church – drug addicts, prostitutes and his friend Donnie. In addition to the church in his home town, Sam makes plans to build an orphanage in Sudan. Trips back to the country only draw him deeper into a tense political situation, and Sam himself becomes the victim, as arsonists attack his first attempt at building an orphanage. The film has some really harrowing scenes – in particular one where Sam goes back to collect a group of children and discovers they have all been killed. That is probably the film’s darkest moment, and you may want to have a tissue or two handy just in case. But the darker moments are interspersed with lighter scenes of happiness, as the youngsters find a home at Sam’s orphanage. Machine Gun Preacher has two narrative threads – what Sam is doing in Africa, and the life he lives and leaves behind in America. Every scene back in America shows him become increasingly frustrated with those who care so little for what is happening on their own planet. Particularly memorable is when he is invited to a barbecue held by a local businessman he has asked for a donation. When that donation arrives, a mere $150, Sam storms out of the party, ranting to his wife and daughter that the man has spent more on salsa for his party than on saving human lives. The increasingly frantic nature of Sam’s quest affects his family life, so much so that he almost sacrifices one for the other. It comes to a head with a scene Despite its bleak subject matter, Sam’s narrative thread does end relatively happily. Machine Gun Preacher had a much gentler ending than I expected, with two emotional scenes featuring Sam. One in particular, brings the film full circle, and involves a beautiful bit of acting from one of the film’s child stars. Despite its name, Machine Gun Preacher is an emotional journey through the troubles of northern Uganda and southern Sudan, an area that is still suffering today.